Madagascar: Escape 2 Africa is a 2008 American computer-animated comedy film produced by DreamWorks Animation and distributed by Paramount Pictures. The sequel to the 2005 film Madagascar and the second installment in the franchise, it continues the adventures of Alex the Lion, Marty the Zebra, Melman the Giraffe, and Gloria the Hippo. It was directed by Eric Darnell and Tom McGrath, with a screenplay written by Etan Cohen, Darnell, and McGrath. Ben Stiller, Chris Rock, David Schwimmer, Jada Pinkett Smith, Sacha Baron Cohen, Cedric the Entertainer, Andy Richter, and Elisa Gabrielli reprise their roles from the first film, and are joined by new cast members Bernie Mac, Alec Baldwin, Sherri Shepherd, and will.i.am. The film begins by showing a small part of Alex's early life, including his capture by hunters, then moves to shortly after the point where Madagascar left off, with the animals deciding to return to New York City. They board an airplane in Madagascar but crash-land in Africa, where each of the central characters meets others of the same species and where Alex is reunited with his parents. Problems arise, and their resolution occupies much of the remainder of the film. Madagascar: Escape 2 Africa was released on November 7, 2008, and grossed $603.9 million on a $150 million budget, making it the sixth highest-grossing film of 2008. It was dedicated to Bernie Mac, who died before the film's release (by coincidence, another film of his, Soul Men, would be released on the same date as this film). A sequel, Madagascar 3: Europe's Most Wanted, was released in 2012. In Africa, Zuba the lion tries to teach his son Alakay how to fight, but the cub is more interested in dancing. Rival male Makunga challenges Zuba for the title of alpha lion, and during their fight Alakay is captured by poachers. The crate containing Alakay falls into the ocean and drifts to New York City, where he is renamed Alex and grows up at the Central Park Zoo with Marty the zebra, Melman the giraffe, and Gloria the hippopotamus. Years later, following their adventure in Madagascar, the zoo animals—Alex, Marty, Melman, Gloria, the penguins Skipper, Kowalski, Rico, and Private, and chimpanzees Mason and Phil—prepare to return to New York aboard a battered airplane piloted by the penguins, accompanied by the lemurs King Julien XIII the ring-tailed lemur, Maurice the aye-aye, and Mort the mouse lemur. The plane runs out of fuel and crash lands in continental Africa. The animals find themselves at a watering hole on a nature reserve, and are excited to meet others of their species. Alex is reunited with his parents and impresses them with tales of his status as "the King of New York". Marty fits in with a herd of other zebras who look and sound just like him. Melman, a hypochondriac, is distressed that the reserve has no doctors, so the other giraffes appoint him their witch doctor. Seeking romance, Gloria attracts the attention of the smooth-talking male hippopotamus, Moto Moto. Meanwhile, the penguins set about repairing the plane, assisted by numerous chimpanzees recruited by Mason and Phil. They steal vehicles from several groups of New Yorkers who are on safari and strip them for parts. Nana, a tough old woman who beat up Alex during the events of Madagascar, takes charge of the stranded tourists and helps them survive in the wilderness. The zoo animals' excitement soon turns to disappointment. In a scheme to oust Zuba as alpha lion, Makunga insists that Alex complete a rite of passage which Alex mistakes for a talent contest. It is actually a fighting contest, and Makunga tricks him into choosing the strongest lion as his opponent, resulting in Alex's humiliating defeat. Faced with the duty of banishing his son, Zuba relinquishes his title as alpha and Makunga takes over. Meanwhile, Marty is dejected by the realization that the other zebras can do everything he can, believing himself no longer unique. Melman comes to believe that he is deathly ill, and Gloria's interest in Moto Moto saddens him since he has secretly loved her for a long time. The four friends argue heatedly with one another. Gloria has a date with Moto Moto, but loses interest when she realizes he is only attracted to her because of her size. After a pep talk from King Julien, Melman finally reveals his feelings for Gloria. The next day, the animals panic when the watering hole dries up. Determined to redeem himself, Alex mends his friendship with Marty and they leave the reserve to investigate upriver. King Julien suggests that offering a sacrifice to the nearby volcano will restore the water. Melman, forlorn and believing he is dying, volunteers to be sacrificed. Gloria stops him from jumping into the volcano, and realizes that he is the perfect guy for her. Alex and Marty discover that the stranded New Yorkers have built a camp and dammed up the river, and Alex is captured by them. Zuba rushes to his aid, but Alex saves them both by dancing for the tourists, who remember him fondly from the zoo. Marty, Melman, Gloria, the penguins, and the chimpanzees arrive in the repaired airplane and help Alex destroy the dam, restoring the water. Makunga angrily makes a stand for control, but Alex tricks him into being subdued by Nana. Zuba offers Alex the title of alpha lion, but he declines, and father and son become co-leaders. Skipper marries a bobblehead doll from the plane, and he, the other penguins, and the chimpanzees head off to honeymoon in Monte Carlo. Alex, Marty, Melman, Gloria, and the lemurs happily decide to stay on the reserve for a while. 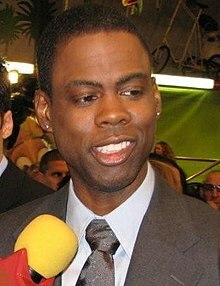 Chris Rock at the Israeli premiere of the film, on November 22, 2008. A sequel to Madagascar had been in development since 2005, when the first film had been released, with a release date planned for late 2008. In the first teaser trailer, which was released in March 2008, the film was subtitled with The Crate Escape. By June 2008, the film was given its final title – Escape 2 Africa. The film received generally mixed to positive reviews from critics. Rotten Tomatoes reported that 63% of critics gave the film a positive review, based on 153 reviews, with the consensus view that the film was "an improvement on the original, with more fleshed-out characters, crisper animation and more consistent humor," and with an average rating of 5.9/10. Another review aggregator, Metacritic classified the film into the "generally favorable reviews" category with 61/100 approval rating based on 25 reviews, also a bit higher a score than the original. Michael Phillips of the Chicago Tribune stated in his review that the film "goes easy on the pop culture jokes, I should clarify: one of the smarter things in the script is how Alex, who digs his Bob Fosse and Jerome Robbins dance moves, becomes the film's primary pop-cult gag." Roger Ebert of the Chicago Sun-Times gave the film 3 stars and wrote "This is a brighter, more engaging film than the original Madagascar. Steven D. Greydanus complained the film's plot was similar to The Lion King, Joe Versus the Volcano, and Happy Feet. Carrie Rickey of The Philadelphia Inquirer gave the film 2 stars and wrote "Take the flat tire that was Madagascar. Retread it with The Lion King storyline. Pump it up with air. Now you have Madagascar: Escape 2 Africa." John Anderson gave the film 3½ approval rating and stated "Madagascar 2: Escape to Africa, the sequel to the enormously successful DreamWorks adventure and a film that hews close to the whole Lion King/species-as-destiny/self-fulfillment paradigm." On its opening day, the film grossed $17,555,027 from 4,056 theaters with an $4,328 average. It went to be at No. 1 at the box office with $63,106,589 with $15,559 average per theater. As of March 19, 2009, it achieved a gross of $180,010,950 (29.8% of total gross) in the United States and Canada along with a gross of $423,889,404 (70.2%) in other regions adding to a worldwide gross total of $603,900,354. Madagascar: Escape 2 Africa was released on DVD and Blu-ray Disc on February 6, 2009, along with two episodes from The Penguins of Madagascar series: "Popcorn Panic" and "Gone in a Flash". In the first week at the DVD sales chart, Madagascar opened at No. 1, selling 1,681,938 units which translated to $27.09m in revenue. As per the latest figures, 7,060,997 units have been sold, bringing in $102,791,511 in revenue. This does not include Blu-ray sales/DVD rentals. A video game based on the film was made for the Xbox 360, PlayStation 3, Wii, PlayStation 2, Microsoft Windows, and Nintendo DS, and released on November 4, 2008, in North America. The video game's gameplay is similar to the first movie's video game with the same characters and moves, although the environment is set in Africa. A sequel titled Madagascar 3: Europe's Most Wanted was released on June 8, 2012. Alex the Lion, Marty the Zebra, Gloria the Hippo, and Melman the Giraffe are still fighting to get home to New York. This time their journey takes them to a traveling circus in Europe which they will reinvent Madagascar style. ^ In July 2014, the film's distribution rights were purchased by DreamWorks Animation from Paramount Pictures and transferred to 20th Century Fox before reverting to Universal Studios in 2018. ^ a b "Madagascar: Escape 2 Africa". Box Office Mojo. Retrieved May 24, 2016. ^ "2008 Worldwide Grosses". Box Office Mojo. Retrieved December 19, 2016. ^ Rodriguez, Brenda (November 24, 2008). "Remembering Bernie Mac". People. Retrieved December 19, 2016. ^ Fritz, Ben (September 14, 2005). "D'Works will rely on animal instinct". Variety. Retrieved October 27, 2011. ^ Sciretta, Peter (March 13, 2008). "Madagascar: The Crate Escape Movie Trailer". /Film. Retrieved April 22, 2015. ^ Sciretta, Peter (June 4, 2008). "New Photos: Madagascar: Escape 2 Africa". /Film. Retrieved April 22, 2015. ^ "Madagascar: Escape 2 Africa Movie Reviews, Pictures". Rotten Tomatoes. Retrieved March 25, 2019. ^ "Madagascar: Escape 2 Africa". Metacritic. Retrieved November 26, 2014. ^ Phillips, Michael (November 7, 2008). "A tamer wild bunch". Los Angeles Times. Retrieved March 26, 2012. ^ Ebert, Roger (November 5, 2008). "Madagascar: Escape 2 Africa". Chicago Sun-Times. Retrieved March 26, 2012. ^ D. Greydanus, Steven. "Madagascar 2: Escape 2 Africa (2008)". Decent Films Guide. Retrieved March 26, 2012. ^ "Time to get these animals out of Africa". The Philadelphia Inquirer. Retrieved November 7, 2008. ^ Anderson, John (November 5, 2008). "'Madagascar: Escape 2 Africa'". Newsday. Retrieved March 26, 2012. ^ "Weekend Box Office Results from 11/7 - 11/9". Box Office Mojo. November 9, 2008. Retrieved November 22, 2008. ^ "All Winners | Kids' Choice Awards". Nickelodeon. Archived from the original on June 14, 2012. Retrieved March 26, 2012. ^ "7th Annual VES Awards". visual effects society. Retrieved December 21, 2017. ^ "DreamWorks Animation Gives a Whole New Reason to Look Forward to Friday ..." DreamWorks Animation. January 8, 2009. Archived from the original on July 19, 2012. Retrieved February 26, 2012. ^ a b "Madagascar: Escape 2 Africa - DVD Sales". The Numbers. Retrieved March 26, 2012. ^ Adams, David (November 16, 2005). "Activision Extends DreamWorks Deal". IGN. Retrieved September 18, 2012. ^ "Madagascar: Escape 2 Africa™ and Kung Fu Panda: Legendary Warriors™ Now Available at Retailers Nationwide". DreamWorks Animation. November 4, 2008. Archived from the original on July 9, 2012. Retrieved March 26, 2012. ^ "Madagascar: Escape 2 Africa :: DS Game Review Read more: Madagascar: Escape 2 Africa :: DS Game Review". Kidzworld. November 4, 2008. Retrieved June 12, 2013. ^ Chney, Alexandra (July 29, 2014). "DreamWorks Animation Q2 Earnings Fall Short of Estimates, SEC Investigation Revealed". Variety. Retrieved July 30, 2014. Wikimedia Commons has media related to Madagascar: Escape 2 Africa.